Animal Protection also a Western Imperialist Conspiracy?! Gui Zhentang Pharmaceutical Company （归真堂）, a company that specializes in bear farming and extracting bile from live bears, is applying for IPO on the Shenzhen Stock Exchange. The news was met with outrage all over social media in China. This company announced shocking plans to expand the number of bears they are torturing from 400 to 1200 with new capital raised through the IPO. So tens of thousands of netizens are petitioning the China Securities Regulatory Commission to disqualify this company from being listed on the stock market. But the Association of Traditional Chinese Medicine (中国中药协会） just published a statement on 2/7 saying that western imperialist interest groups are stirring up these protests against bear farms in order to undermine the traditional Chinese medicine industry and enhance the dominance of western medicine companies. 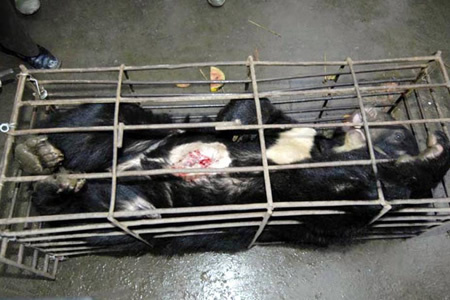 Bear bile is considered a precious ingredient in traditional Chinese medicine. Despite the fact that there are already synthetic alternatives that prove to have the same medical effects as bear bile, companies like Gui Zhentang still kept moon bears (an endangered species in cages, cut a hole in their stomach and stick a tube into their gall bladder to drain bile from them everyday. 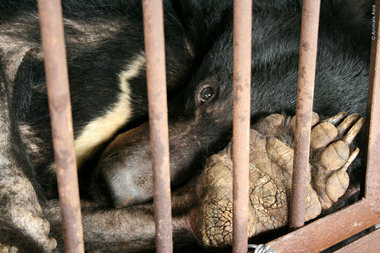 NGOs like Animal Asia and End Bear Farm have detailed documentation of such cruel practices on their websites. The philosophy of traditional Chinese medicine used to center on the harmonic relationship between human and nature, but look at what the Association of Traditional Chinese Medicine has turned into. It has become a defender of greedy corporations who torture endangered animals for profit. If protection of animals is another western conspiracy of to hinder the rise of China, does that mean all the Chinese netizens who are sympathetic to the suffering bear are just fools manipulated by western imperialists? Is it anti-China to care about animals?